Map is showing Swaziland, the small landlocked kingdom in southern Africa, bounded by South Africa and Mozambique. With an area of 17,364 km² it is one of Africa's smallest countries, slightly larger than half the size of Belgium, or slightly smaller than the U.S. state of New Jersey. Despite its size, its climate and topography is ranging from the cool and mountainous southern African inland plateau of the highveld, to the less populated hot and dry lowveld, a typical African bush landscape of grasslands and thorn trees. Swaziland highest point is Mount Emlembe with 1,862 m, located in the east Drakensberg mountain range on the border with South Africa. The country is known for its game reserves, the Mlawula Nature Reserve and the Hlane Royal National Park with diverse wildlife including lions, hippos and elephants. 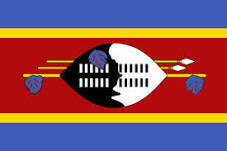 Swaziland has a population of 1.2 million people (est. 2010), national capitals are Mbabane, and Lobamba. Depicted on the map are the country's international borders, the national capitals of Mbabane, and Lobamba, district capitals, towns and villages, main roads, railroads and main airports. Bhunya, Big Bend, Bulembu, Forbes Reef, Hlatikulu, Hluti, Kwaluseni, Lavumisa, Lavumisa, Lobamba (royal and legislative capital ), Lomahasha, Malkerns, Maloma, Mankayane Gege, Manzini (second largest urban center), Matata, Mbabane (largest town and the capital of Swaziland), Mhlambanyatsi, Mhlosheni, Mhlume, Ngwenya, Nhlangano, Nsoko, Piggs Peak, Sicunusa, Sidvokodvo, Siphofaneni, Siteki, Tjaneni, and Usutu. 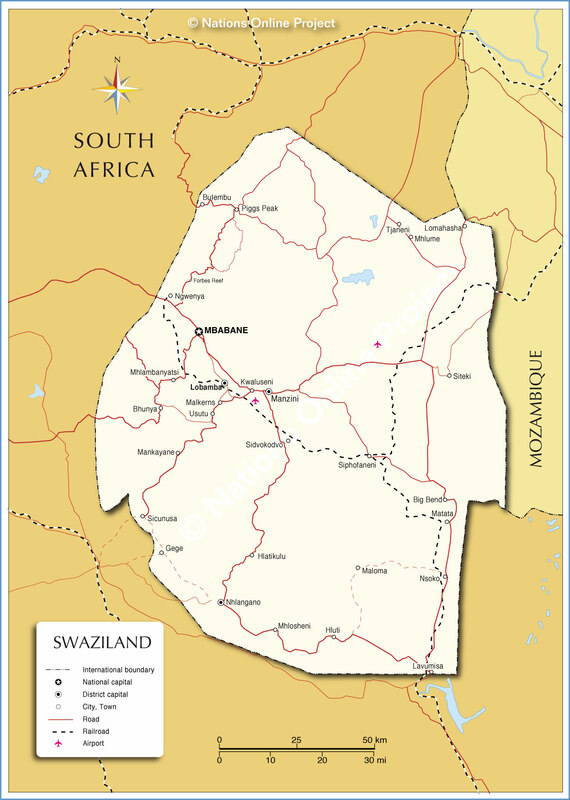 Searchable map/satellite view of Swaziland. Manzini (formerly known as Bremersdorp) is the capital of Swaziland's Manzini District. The city is the country's second largest 'city' behind Mbabane with a population of 79,000 (2014).